Today we led Mass in the hall for our parents and parishioners on the feast of St. Wilfrid. Wilfrid lived in the seventh century and is one of the greatest English Saints. He worked very hard to try to get the Church to use the Roman method for calculating the date of Easter. This is the method that we still use today. 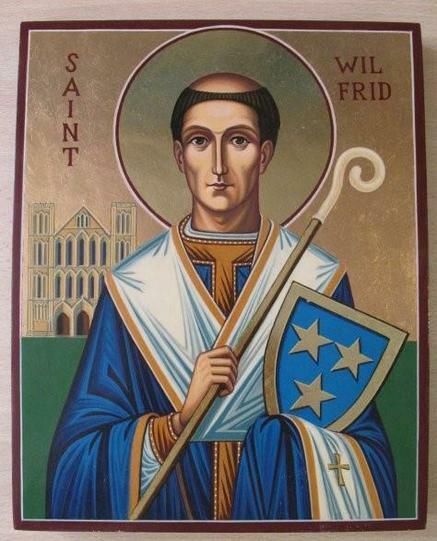 Wilfrid became Bishop of York and looked after churches across the whole of Northumbria. He even had more churches built. In addition to this, Wilfrid ordered many monasteries to be built for monks to live in. Most of the Kings and Queens of the time liked Wilfrid and trusted him...however Wilfrid also made many powerful enemies and was banished from Northumbria...twice! When this happened, he went straight to the Pope in Rome to ask for help and was not afraid to bother the Pope when he felt that he was being treated badly. In total he made three journeys on foot and horseback through Europe to Rome. Wilfrid’s life was threatened many times: being shipwrecked and nearly killed by natives off the coast of Sussex; imprisoned in Northumbria by the king; and twice nearly murdered whilst travelling abroad! What a brave saint!